Well, I’ve got a lot of pots on the stove, but nothing ready to show right now, so I thought I’d share one of my old afghans. 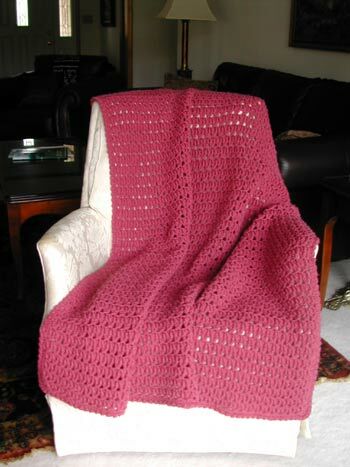 I crocheted this one several years ago. The pattern, called Campus Colors, suggests using ecru and your university colors, which are worked up in a mix of skinny and wide stripes. That doesn’t really work out if, say, the university colors are red and white. Ecru, red, and white? But it looks nice in the colors they used: ecru, dark gray, and gold. Anyhow, I liked the design and did it in some Country Rose Red Heart Super Saver I had hanging around. I know, I know…ugh…but the thing has worn like iron. We use it on a daily basis and I’ve washed it a zillion times (I’m a clean freak) and it hasn’t pilled at all. It pretty much looks the same as the day I made it. Somehow it has come to reside in our living room (which I never intended) and it doesn’t match anything there. I’ve got to replace it with a new one that goes with the colors in our rug. But for now, it’s a dangrous combination with our couch. Lie on the couch under the afghan and you’ll be asleep in less than five minutes. 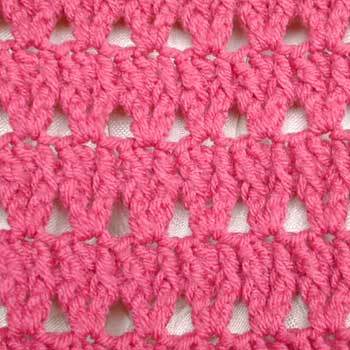 I love the texture of the stitches and it works up quickly and easily using a combination of V-stitches and front post double crochet. Thanks, Julie! You’ll love it. Once you get the rhythm of the pattern going, you can fly through it. 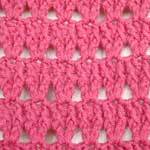 A really satisfying crochet! That’s really nice Donna, I like that one. I may have that book, I’ll have to check for the pattern. Welcome to the ring ^_^ I approved you. Hope you are having a great Monday!